← You Want Money for a Data Center Buildout? Modern Data Centers are very complex environments. Data center operators must have visibility into a wide range of integrated data bases, applications, and performance indicators to effectively understand and manage their operations and activities. Unfortunately, in many cases, the above systems are either done manually, have no standards, and had no automation or integration interconnecting individual back office components. This also includes many communication companies and telecommunications carriers which previously either adhered, or claimed to adhere to Bellcore data and operations standards. In some cases, the lack of integration is due to many mergers and acquisitions of companies which have unique, or non standard back office systems. The result is difficulty in cross provisioning, billing, integrated customer management systems, and accounting – the day to day operations of a data center. Modern data centers must have a high level of automation. In particular, if a data center operator owns multiple facilities, it becomes very difficult to have a common look and feel or high level of integration allowing the company to offer a standardized product to their markets and customers. With most commercial or public colocation and Data Centers customers and tenants organizations represent many different industries, products, and services. Some large colocation centers may have several hundred individual customers. Other data centers may have larger customers such as cloud service providers, content delivery networks, and other hosting companies. While single large customers may be few, their internal hosted or virtual customers may also be at the scale of hundreds, or even thousands of individual customers. To effectively support their customers Data Centers must have comprehensive OSS capabilities. Given the large number of processes, data sources, and user requirements, the OSS should be designed and developed using a standard architecture and framework which will ensure OSS integration and interoperability. We have conducted numerous Interoperability Readiness surveys with both governments and private sector (commercial) data center operators during the past five years. In more than 80% of surveys processes such as inventory management have been built within simple spreadsheets. Provisioning of inventory items was normally a manual process conducted via e-mail or in some cases paper forms. Provisioning, a manual process, resulted in some cases of double booked or double sold inventory items, as well as inefficient orders for adding additional customer-facing inventory or build out of additional data center space. The problem often further compounded into additional problems such as missing customer billing cycles, accounting shortfalls, and management or monitoring system errors. The new data center, including virtual data centers within cloud service providers, must develop better OSS tools and systems to accommodate the rapidly changing need for elasticity and agility in ICT systems. This includes having as single window for all required items within the OSS. 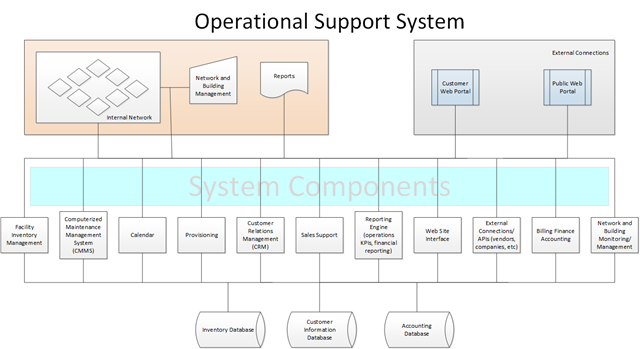 Preparing an OSS architecture, based on a service-oriented architecture (SOA), should include use of ICT-friendly frameworks and guidance such as TOGAF and/or ITIL to ensure all visions and designs fully acknowledge and embrace the needs of each organization’s business owners and customers, and follow a comprehensive and structured development process to ensure those objectives are delivered. Use of standard databases, APIs, service busses, security, and establishing a high level of governance to ensure a “standards and interoperability first” policy for all data center IT will allow all systems to communicate, share, reuse, and ultimately provide automated, single source data resources into all data center, management, accounting, and customer activities. Any manual transfer of data between offices, applications, or systems must be prevented, preferring to integrate inventory, data collections and records, processes, and performance management indicators into a fully integrated and interoperable environment. A basic rule of thought might be that if a human being has touched data, then the data likely has been either corrupted or its integrity may be brought into question. Looking ahead to the next generation of data center services, stepping a bit higher up the customer service maturity continuum requires much higher levels of internal process and customer process automation. Similar to NIST’s definition of cloud computing, stating the essential characteristics of cloud computing include “self-service provisioning,” “rapid elasticity,” ”measured services,” in addition to resource pooling and broadband access, it can be assumed that data center users of the future will need to order and fulfill services such as network interconnections, power, virtual space (or physical space), and other services through self-service, or on-demand ordering. To accomplish this will require nearly all above mentioned characteristics of the OSS to have inventories in databases (not spreadsheets), process automation, and standards in data structure, APIs, and application interoperability. And as the ultimate key success factor, management DSS will finally have potential for development of true dashboard for performance management, data analytics, and additional real-time tools for making effective organizational decisions. As always, spot on! Great subject matter from a true subject matter expert.